Dew Claws: Should They Stay or Should They Go? Dew claws appear to be rather unnecessary body parts that hang from a dog's paw and serve no purpose at all. Lets have a look at the function of dew claws, and when it is considered appropriate to have them removed. Dew claws are fairly common on the front paws of dogs, and can sometimes be found on the hind paws as well. They are positioned on the inside of the paw, slightly higher than the other claws, and are therefore not used to walk on. Unlike nail trimming, which is a simple painless procedure that should form part of your dog's regular grooming routine, and can be undertaken by anybody with a nail trimming tool, dew claw removal involves painful permanent surgical removal of the entire toe. Many dog breeders elect to have the dew claws removed, for aesthetic or practical reasons, when the puppies are just a days old. At this stage the bone and tissue is undeveloped and soft, making it a relatively simple, but possibly unnecessary procedure. Dew claw removal in older dogs is much more complex, and involves surgical removal by a veterinarian. As this is a very tender area for the dog, it very often leads to complications after the operation as the paws are easily accessible, so constant licking and biting at the wound can limit its ability to heal, resulting in the wound becoming infected. So considering dew claw removal is extremely painful for a dog, why do people have their dog's dew claws removed and put their pet through so much trauma? Unfortunately, there are people who have these appendages removed simply because they consider them to be unsightly and serve the dog no purpose. However, there are instances when dew claw removal is completely justified. Because they tend to dangle about, dew claws do pose a risk of being snagged on a carpet or caught on branches as the dog runs through dense bush. This could result in painful injury should the dew claw get ripped off.. In most cases, dew claws can be left on the dog without any problems, but there may be instances when it is preferable to have them surgically removed. Front dew claws are found on most dogs; they generally don't pose any problems and are in fact used by the dog for holding bones or toys. Dew claws on the hind legs are not as common, are usually loosely attached and dangle about, posing a real risk of being snagged and ripped off the skin, which is extremely painful for the dog. As dew claws do not touch the ground, the nails on these claws are not worn down. This can result in the nail growing round and into the skin of the dog's paw, which can be very uncomfortable for the dog. If this goes unnoticed and the nail is not trimmed it can pierce the skin and lead to a very nasty, painful infected wound. To avoid this, make sure that your dogs nails are trimmed regularly, paying special attention to dew claws that do not wear down through physical activity. Dew claw removal in dogs in understandably a controversial matter, and a decision that ultimately rests on the breeder or owner. However, it is recommended that if your dog's dew claws were not removed as a puppy, and they are not presenting any problems to the dog, or are not likely to result in serious injury through snagging, then rather leave them alone rather than subjecting your dog to costly, painful surgery. If you feel your dog's dew claws pose a risk of serious injury, and would prefer to have them removed, try and have them removed while your dog is under aneasthetic for other surgery (for example, sterilisation) where possible. Whether you own a troublesome dog that is causing consternation in the neighbourhood with his constant barking, or you live next door to someone that has a dog that insists on barking persistently, help is at hand in the form of the Acquiesce Ultrasonic Bark Controller. The Acquiesce Ultrasonic Bark Controller is a training aid that conditions the dog to stop barking, and is very effective at reducing nuisance barking. When the device is activated it detects the sound of a barking dog and emits a high-pitched sound that both distracts the dog, and offers a level of discomfort that makes him refrain from barking. The dog soon learns to associate barking behaviour with the unpleasant auditory stimulation that is induced, and is eventually conditioned to stop barking persistently. While the ultrasonic sound is uncomfortable for dogs, it is a very high frequency that is inaudible by humans, so will not disturb you or your neighbours, only the dogs. Unlike spray and shock anti-bark collars, which are also effective, but may cause a dog some distress, the high-pitched ultrasonic sound is more of an irritating distraction to the dog. Being completely weatherproof, the device can be used indoors or outdoors, and unlike an anti-bark collar, it is effective at reducing nuisance barking in multiple dogs, and for controlling nuisance barking in dogs that don't reside on your property. The Acquiesce Ultrasonic Bark Controller is equipped with 4 sensitivity settings. It also has a test button, which will emit an audible sound when pressed allowing you to check the sensitivity levels and that the device is working properly. When using the Acquiesce Ultrasonic Bark Controller outdoors simply position the device so that it points to the area where the dog spends most of his time, or where the barking behaviour is more prominent, such as the front fence or gate. Take caution when placing the device that there are no obstacles (solid fences, hedges or thick bushes) in the path, which may render it less effective. If you are wanting to control nuisance barking in a neighbours dog, position the anti-bark unit in an elevated position, such as on top of a fence, or attach to a tree or pole, and point it in the direction of the barking culprit. The Acquiesce Ultrasonic Bark Controller is fitted with 4 powerful speakers that makes the anti-bark device effective for up to 100m2 outdoors. When using the device indoors, switch to Inside mode, where only 2 of the speakers will be operational, giving a volume suitable for indoor use. It runs on either 2 or 4 9 volt batteries (not included) – 2 batteries will give you 3 months use, 4 batteries will give you 6 months use. The anti-bark unit can be wall mounted or free standing for full portability. If you are wanting to curb unsocial barking behaviour in dogs, the Acquiesce Ultrasonic Bark Controller is recommended as a humane option that will condition your dog, or your neighbours barking dog, to stop barking. Even when there is nobody around to correct the dog, the anti-bark device silently does the job of alleviating nuisance barking by providing automatic bark detection and corrective action to passify your neighbourhood. With Christmas just around the corner, you may be wondering what surprise Santa can bring the kids this year. This may be the perfect opportunity to introduce your child to the joys of pet ownership. For many young children a hamster, rat or mouse makes an ideal first pet. They are easy to care for, can be kept indoors in the child’s bedroom, and they make a wonderful introduction to pet ownership, giving children lots of joy while teaching them about the responsibility of caring for their very own pet. My favourite cages for hamsters and mice belong to the Critter Trail line. These are colourful, funky cages, made from anti-microbial moulded plastic, that come in a wide range of zooty designs. They come fitted with fun accessories, and extra items can be purchased to add to the cage at will. Lets take a look at some of the options in this range. The Critter Trail Dazzle is for the discerning glitterati critter, and is a fantastic choice for young girls. This dazzling purple glitter cage offers bling-bling for your critter. They cage itself is well ventilated, with a deep bottom tray to hold pet litter and prevent spillage. The main feature is the removable orbiting wheel, which sparkles as it turns – a real eye-catcher indeed. The cage comes fitted with plastic climbing tubes, and a tunnel leading up to a petting zone. While this is a really snazzy cage, the downside is that it is not that practical when it comes to cleaning – but beauty comes with a price and there are some who may find this a small irritation considering its stylish good looks. The Critter Trail X offers a fun filled activity centre for your critter. The striking combination of purple moulded plastic together with lime green accessories makes this a funky cage suitable for both boys and girls - and their critters of course. It has a spiral staircase/slide leading to an exterior glow-in-the-dark exercise wheel, which moves on its axis as it rotates – very cool. Another feature of this cage is the extractable petting zone, which also comes in handy to contain your hamster when you are cleaning his cage. The wheel can be a bit noisy if the hamster takes his food or bedding into it, making it rattle and hum, but this is a common problem with closed wheel accessories, and it can be easily fixed by taking it apart for a good clean out. Z for zooty, Z for zoom, the Critter Trail Z offers both style and a fast paced lifestyle for your critter. It comes in stylish contrasting shades of blue, purple and green and offers some nifty features. The most striking feature is the removable glow-in-the-dark exercise ball, accessed by funnels, providing your critter with ample work out opportunities – it can even be removed for him to run around safely on the floor! The cage is also fitted with a petting zone, where your little furry friend can catch some zzzz's after all that exercise. Many dog owners have to deal with the frantic woes of a stressed pooch that becomes completely possessed during a thunder storm or other loud noise disturbance. Noise phobia is a common problem in dogs, and although it is not harmful in itself, it causes the dog much stress and anxiety, and can lead to dangerous, life-threatening situations should the dog run away in its efforts to escape the noise. Many a dog has been lost like this, some with fatal consequences. I myself have owned no less than five dogs that I have personally plucked from a busy roadside on various occasions, and was unable to reunite with their original owners. Four out of those five dogs suffered from noise phobia, and when the thunder rolled I had to dive for the doggie calmettes (two have sadly passed on after spending a long and happy life as my little orphans). The problem with administering calming drugs and potions is that it doesn't cure the problem, and if you are not at hand to administer the medication, your dog will still be traumatised by loud noises. Furthermore, if you are not there to pacify your pooch or offer any comfort it may take fright and run off. However, help is at hand in the form of the Clix Noises & Sounds Therapy CD For Dogs. This fireworks and noises desensitisation training CD is an ingenious solution to solving noise phobia issues in dogs – in fact, it may even work to desensitise other animals, such as horses. 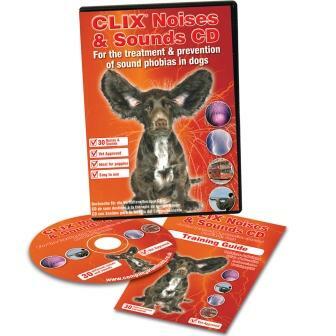 The Clix Noises & Sounds Therapy CD is especially useful for desensitising puppies to a variety of noises and sounds to prevent noise phobia developing at a later stage. For dogs that already suffer from noise phobia, the situation can be rectified by introducing them to the sounds on the CD at low volume, and then gradually increasing the volume level to desensitise your pooch to become accustomed to the surrounding din. The CD contains a total of 30 different sound tracks covering most common noises that your dog is likely to experience, split up into 4 different noise categories. The following sound categories are covered: Bangs, which includes fireworks, gun shots, and thunder storms; transport, which includes sounds of trains, aeroplanes, buses, and road work activities; general household noise, including the sound of a lawnmower and vacuum cleaner; and people noises, such as children screaming and shouting, noisy crowds, and crying babies. The Clix Noises & Sounds Therapy CD for Dogs comes with a training manual that offers guidance on the most effective use of the noise CD to desensitise your dog to all sorts of loud sounds and bangs. This is a must have for anyone that owns a dog that is terrified of loud noises, and is highly recommended for every dog owner to prepare their pet for the sound of fireworks well ahead of Guy Fawkes night, which will be upon us shortly on the 5th November. Taking the time and effort to prepare your pet for scary events such as fireworks, thunder and other loud bangs, may prevent your dog from running off in a terrified frenzy, and may even save your pet's life. Cats are independent by nature, and like to be in control of things. When they are not, they can become quite distressed. Common causes of stress in cats include moving to a new house, travelling or being crated, visits to the vet, or the presence of other cats within its territory. Obvious signs of stress include wild eyed frenzy accompanied with the desperate need to escape; irritability, including persistent meowing; urinating or scent marking; and scratching on furniture, bedding, or carpets. Some of these symptoms are often mistaken for errant behaviour, but in order to cure the behaviour, one needs to reduce the levels of stress being experienced by your cat. Feliway Feline Facial Pheromones (try saying this after you've had a few) is a product recommended by vets to calm and comfort stressed cats, and alleviate unwanted stress related behaviour. This product uses artificial feline pheromones that cats naturally give off from their facial area to mark a safe territory once they feel comfortable and secure within the confounds of the area. Cats do this by rubbing their faces on objects within their territory, giving off facial pheromones to mark the area with their scent, which acts like a kind of kitty comfort blanket that gives them a sense of security and well-being. The artificial feline pheromone spray replicates the natural scent that cats leave when they conduct this scent marking routine, and in so doing, offers a sense of security to alleviate stress and calm the cat down. Feliway feline pheromones offer an affective solution to reducing stress in distressed cats by replicating the cats natural mechanism that it would use to relay a sense of comfort and well-being, in order to help him deal with a stressful situation. Feliway Feline Pheromones can be purchased in a spray bottle, which is ideal for spraying directly onto objects, for example spraying inside a travel crate to offer comfort and reassurance and alleviate stress associated with crating and travel. 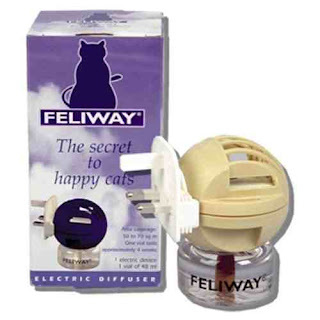 The Feliway Feline Facial Pheromone Diffuser offers a novel method of keeping a well-adjusted, happy cat that always comes home to snuggle up in a cosy corner, or just laze contentedly around the house. The feline pheromone diffuser plugs into an electrical wall socket, giving off a constant burst of feline facial pheromones. Your cat will truly believe that there is no place like home. Besides relieving stress and anxiety in cats, this product is also affective for controlling behaviour such as territory marking by urine spraying, and clawing at furniture, which are often related to stress associated with the introduction of another cat or pet into your home (or rather, the cats home). The diffuser fills the room with feline facial pheromones, and the calming action of the pheromones reduces anxiety and alleviates the behaviour associated with territory and scent marking. The Feliway Feline Facial Pheromone diffuser comes with a 48ml vial, which lasts up to four weeks. Refills for the diffuser can be purchased separately. Feliway Feline Facial Pheromones are also available in a 60ml spray bottle and a 15ml travel bottle for easy portability when needed away from the home environment. After I had learnt to live with the shock of my 11 year relationship ending, I started to go through another trauma, the loss of my beloved fluffy tiger (actually a cat, but she thought otherwise). Not only did I miss her terribly but I was also concerned about how she would feel without me. Would she eat properly? Would she get stressed out looking for me? Would she fight with the other cat because of misplaced anger? Unfortunately, for various reasons, I had no choice but to leave her with my ex and the other cat. We were so close, she was a real fusspot and would only ever come to me for cuddles. She was completely my baby. Sadly if you have a strong bond with an animal then there's a very big chance that they will go through their own heartbreak at the divorce and at losing you. Their routine and home life will be forever changed and that will cause them anxiety and stress. Sadly during the difficult time of separation our pets are often the last thing on our minds. Of course this is understandable as your head will be a mess and your whole life as you knew it has probably just disappeared. Most animals will pick up on the hostility and anger and may be very scared and confused. Then you have the problem of deciding which one of you will take care of the pet. Below are some helpful tips when thinking about your pet during a break up. If you have children take into consideration that they probably have formed strong attachments to your pets. It is recommended that the pet isn't separated from a child if at all possible. Stability for them both at this time is so important. They can be a great source of comfort to children when their parents are splitting up. Giving your child some pet responsibilities and encouraging them to develop a closer bond to your animal, will undoubtedly be a comfort and help to both of them. Remember you are the adult and can handle this better, help your child and pet at this time, they'll always be your family. Ensure that when you are first discussing the terms of your separation that you include any pets. If you leave this till the end it could become difficult. Make it clear who will care for the pet and any visitation rights. Don't let it get confusing, stick to the decision. Think about your living arrangements when deciding with whom the pet will live. Make sure your pet goes to the owner that can offer the best care and best home, even if this means it isn't you. Outside space and a comfortable home will be important factors to think about. Put your needs second, it's hard to do, but is necessary. If you end up with the pet then take comfort from them rather than shutting him or her out of your problems. They will feel your energy anyway and their natural instinct will be to nurture you. If you have a cat, buy a new cat stand and some toys to play with them. You can buy cat sprays that will calm them down like Feliway Feline Facial Pheromone Diffuser. Give them attention so your bond is reinforced. If you own a dog take it for long walks this will help to clear your head and the dog will enjoy time just with you. If you are keeping the family pet then remember that they will need a lot of love and comfort when your ex leaves. Regardless of how you broke up or what your opinion is of your previous partner/spouse, they were a part of your pet's life. Seek the advice of your vet immediately if your pet shows any signs of depression such as not eating or behavioural problems. Allow yourself to grieve if you lose your pet in the process of divorce/separation. The love between a pet and their owner is very strong and it will be natural for both of you to be upset at this loss. Whatever you do don't argue or shout in front of your pet. This could leave them feeling frightened and insecure. Don't take your anger out on your pet. Just remember how much they love you and how confused they are. This will be a new beginning for them as well. Never use your pet as a bargaining tool in your divorce. If you want to do that, bargain with the furniture, never with children or animals. Always keep in mind what is in your pet's best interest. Only approach the court for custody if it is a last resort. Try talking to your spouse or attempt mediation first. For further advice speak to your vet who should be able to advise on caring for your pet during a divorce or separation, especially if they become stressed. For legal advice concerning custody or contact with your pet you should consult a solicitor. Although bonfire night is an exciting evening for all the family, it is not something that your pet enjoys or understands. Naturally, your dog, cat or other pets will go through fear and stress because of the loud noises and bright lights. Remember their safety and comfort is of upmost importance on any firework night. They will suffer from different reactions depending on their age and characteristics. There are all sorts of behavioural signs to keep an eye out for. They may become withdrawn and quiet, often seeking a hiding place, suffer from uncontrollable shaking, vocalisation and even fouling in the house. Although these symptoms can be very alarming for the pet owner to witness and for the pet to experience, even the most fearful of pets can be helped with a combination of behavioural and medical treatments. Firstly make sure all pets are safely inside the house well before dark. Fit all dog walks and outside activities in during daylight hours, ensuring they are all in and settled by mid afternoon. It sounds stupid to point out, but don't walk your dog when the fireworks have started and certainly do not take your dog to a firework display. Some people still need to be told the obvious. If they bark at the noise don't think it means they're enjoying it and joining in, it means they are stressed! Even if your pet is deaf they will still find the vibrations and flashing colours alarming. Close the curtains early in the evening before any fireworks begin. Block up cat flaps and put a television or radio on at a high volume to block sounds from outside the house. Don't pay any attention if he paces around or whines, and do not reassure him as this will only make him think there is something to worry about. Stay calm and act normally even if you want to comfort them. It will be reassuring enough for them that you are at home. If your pet finds a hiding place during fireworks, don't disturb them let them come out of their own free will when they feel safe to do so. You can pre-empt this by making a den for your pet in a safe place in case they wish to hide later on. Under the stairs, in a wardrobe, or under a table make good hiding areas. If your pet accidentally fouls in the home don't tell them off this is just a stressful reaction to the noise. There are herbal, pheromone and dietary supplement options available to help reduce fear and anxiety. Feliway for cats in spray and diffuser form can assist in calming your cat down. Dog appeasing pheromone products are available on our website too. Smaller animals like guinea pigs, ferrets, rabbits and birds all need to be treated with extra care on firework night. These animals can easily die of heart attacks as a result of the loud noises and flashes of colours. If you can bring hutches and enclosures into a cool, quiet room indoors, or into a garage or shed. Give your pet extra bedding to burrow into so he feels secure. If you cannot bring your pet's hutch inside, you should turn it around so that it faces a wall or fence instead of open space. So remember and enjoy the 5th of November" … but please don't forget your pets. One of life's biggest stresses is moving home. This applies to your pet as well. The different sounds, sights and smells of the new house can be very upsetting for them. It may take up to a few weeks for them to settle in to their new surroundings. The journey, however short or long, can also be very traumatic for animals. Obviously we know what's going on and that the trip will end with us being settled into a new home. Your pet however doesn't know this, so be patient with them and try to follow the tips listed below. • Keep your pet secure in one room while you are doing all the packing and unpacking. Put their food and water bowls in the same room along with their bedding, toys etc. With the upheaval they'll sense that something is changing which might make them want to go and hide in the garden or at a neighbour's, so keeping them in one area is strongly advised. • Don't clean your pet's favourite toys and bedding before you move, so that it keeps the familiar smells for them when they're in the new home. • Don't feed your pet too soon before leaving your home on the day you move, three hours before should be fine. If your pet suffers from travel sickness this will only add to their distress. Consult your vet if travel sickness medication is required. • All pets like routine as this makes them feel secure. Try to stick to your normal patterns leading up to the move and as soon as possible after you're in your new home. • Give your pet lots of attention before, during and after your move as while you're packing he might think that he's being left behind and not coming with you. • If you're really worried about your pet during all the disruption of packing up your home, you could consider using a kennel or cattery for a few days, especially if they've been there before and enjoyed it. Keep in mind that you'll have to book your pet in some time in advance and you'll need to make sure that all their vaccinations are up to date, as decent establishments will request to see a vaccination certificate. Another idea is to ask a family member or friend that your pet is comfortable with to house them for a week or so, just whilst you're moving and unpacking the other end. Your pet will then only have to cope with one trip to their new home after you have dealt with the dreaded moving in day and unpacked. • It's strongly advisable for a few weeks after you have moved to keep your pet indoors, because their natural instinct may be to try to find their way back to their original home. For dogs going outside, make sure you go with them and that they are wearing an up-to-date identity collar. Microchipping is also a good idea for any pets that go outside. Don't let dogs off the lead until they have had time to get used to their local parks and landmarks. Cats are best kept indoors again for a few weeks until they have also gotten used to their surroundings and scents. • Don't forget you will need to find the best vet in your area. Ask around at local pet shops, your neighbours or dog walkers/carers in the area. Also ensure your pet records are sent from your old vet to the new one. Horses need lots of care and maintenance in order to keep their manes and tails in top quality condition, this is to avoid their hair becoming dull, lifeless and brittle and finally to prevent the horses health suffering in the near future. The Furminator Equine ensures that your horse hair is always in tip top condition and after using this new invention, your horses hair will be short and glossy. The Furminator for horses, works by gently removing the horses' winter coat or any loose hair throughout the year, it helps to replace the horses' natural oils, which in turn provides healthier skin and a shiner & smoother coat for your horse. Being efficient, is what this horse tool is good at, it also makes grooming time for your horse and you much more of a walk in the park and a time to actually put aside and enjoy, rather than just a grooming ritual that needs carrying out every so often. The Furminator deshedding tool is completely different from a regular brush or comb; mainly by the way it works, in which it is pain free for your horse, very efficient when in use and effective in the results it achieves. An added benefit is that the shedding period of the horses hair is drastically decreased with this new brush and of course another important benefit is that it is completely safe and has no adverse effects on your horse. Grooming time should be a relaxing and calming experience between your horse and you and this Furminator grooming tool ensures that it is just that. The results after using this regularly, really do speak for themselves - this in turn ensures that not only your horse is happy but you are too! When using this deluxe Furminator I could really notice the big difference, it did not look like much when it came though in the post, but the actual results were very noticeable and my horse seemed happier with the whole experience of me trying this product out on him one afternoon too. I was very happy with the time it took to comb his entire body, after a short while I had loads of hair collected and put to one side already. This is a great product that has worked successfully with my horse and me and it has definitely sped up his shedding process which has made his coat in better condition and also made our lives much easier all round. It is very comfortable to hold in the hand and while I was using it I found it to be very strong and it will definitely last for a long time. It also seemed that other customers rated this product well when I looked on the review, almost all of them giving this a five out of five, which is also what I would rate this Equine Furminator for horses. 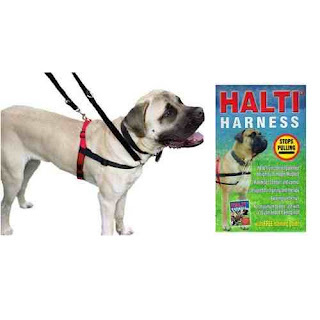 If your dog is always pulling on the leash then look no further, this Halti Training Head Collar for your dog is the perfect solution to your problem. This training collar fits easily onto your dogs head and works by ultimately giving you more control over your dog. As we know the concept behind the Halti Dog Training Head Collar is to give you more control over your dog, this works by the collar being fitted onto your dogs head rather than the neck, this then enables you to guide your dogs head first wherever you walk or wherever you wish for him or her to go, then the rest of your dogs body will also follow in that direction after. The Halti Dog Training Head Collar will then in turn make walks a much more enjoyable experience for you and your dog, rather than you seeing the dog walk as purely a job that needs to be done, it will make it more like an enjoyable leisure activity. By using this dog collar the dog will learn to follow your lead and it will help you to teach your dog commands and general good behaviour. One of the most important aspects is that the dog will not experience any pain or discomfort from wearing this Halti Dog Training Head Collar due to the quality padding and an added benefit is the ease of training with this collar. It is a quick and simple training device, especially for those that do not have time for intense training sessions with their dog. I found this Halti Collar for dogs to be an excellent choice with mine and I would recommend it to anyone that has a dog who is constantly pulling on the leash, or even for those who wish to simply train their dog and use this as an aid. The reason behind me purchasing the collar was that my dog needed to learn to stop pulling me along the path at a million miles an hour, it wasn't going to be long before I landed flat on my face with possibly disastrous consequences, therefore I had to take action and look for a solution and that is when I came across this. It has lived up to all my expectations and now I can enjoy walking my dog as she is much better behaved. I feel that I am in total control of her now and I am happy to say that her constant pulling has drastically decreased which means we can enjoy a leisurely stroll along the promenade. I actually get the time now to take in the sights around me. It is not only me that has had a positive experience with this product, I have noticed other customers have rated it very highly too, with most giving it a 5 out of 5 score. This definitely is one of the best dog training aids on the market and the Halti Head Collar certainly comes with a thumbs up from me! As a nation of cat lovers, we all know how much our cats like to come and go and have their own freedom and space, generally doing as they please and we as their owners like to fulfil those wishes. Cat flaps are a way of ensuring your pet can have his or her freedom, while at the same time keeping the home secure. Many cats go off on their adventures, playing with others, marking out their territory and all sorts of fun exploring, but when the cat decides its time to return home to its family, what you do not want is him or her bringing their mates back home with them. There has been many a time that cat owners have returned home to find that they have acquired an extra cat in their home, due to the cheeky newcomer using the cat flap for the resident pet. 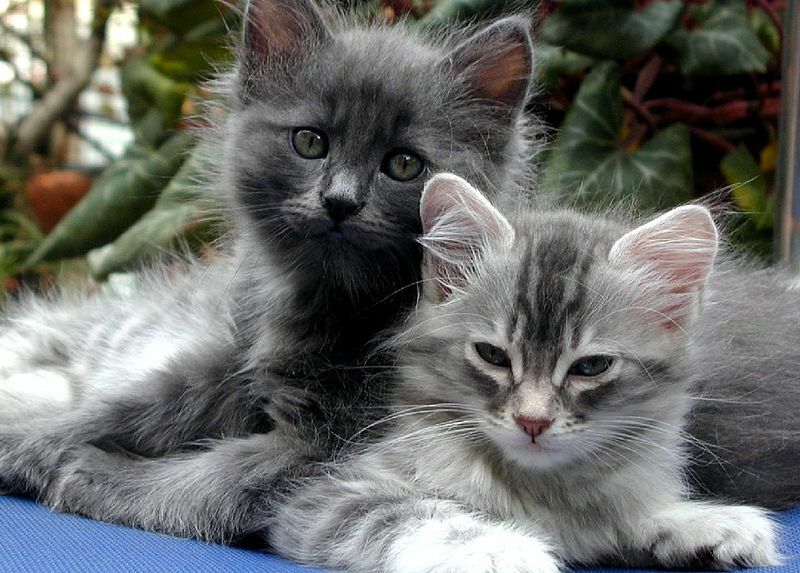 This can sometimes cause problems between cats such as; your pet may get territorial with the other cat and mark territory or even have a scuffle, the other cat may be not be neutered which could be a problem if yours are not neutered either, the newcomer may not be house trained and could cause destruction, plus many more other important concerns. The answer to this problem is to purchase a Sureflap Microchip Cat Flap which is completely unlike the normal pet flaps. This cat flap has a Sureflap microchip, which is an innovative work of art and it really does show how advanced technology has become these days. 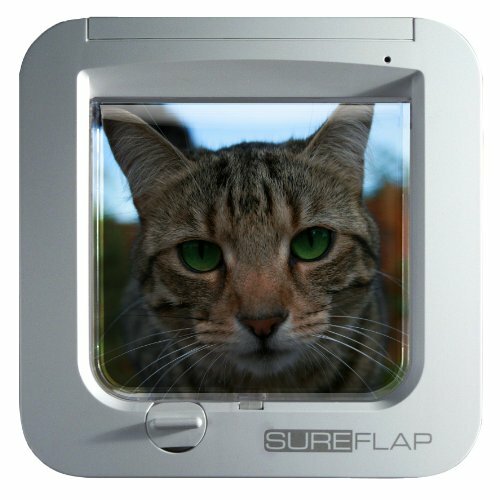 How it works is very simple; Once the Sureflap Microchip Cat Flap is set into learn mode, you should ensure your cat passes through it, once he or she has passed all the way through and is out the other side, the special microchip technology in the cat flap will save your cats personal microchip I.D. into the built in memory, by doing this it ensures that the flap will only allow access to your very own cats inside the home which ensures the problem is solved. The benefits of this microchip design are, the cat flap fitting is easy, as it will fit most doors, walls and windows, it also has a magnetic latch, which will ensure that other daring felines cannot successfully open the microchip cat flap and roam free around your house. This Sureflap cat flap also works if you own quite a few cats, as up to a whopping 32 ID's can be stored, so it is a very economical cat flap especially if you own more than one cat! The microchip cat flap is compatible with your cats own existing microchip, which means that your cat doesn't have to wear a special tag or collar to enable this system to work. As well as looking smart and modern this product really does the required job of being a secure electronic cat flap very well and you can rest assured that there will be no more unexpected visitors sitting on your couch when you return home. It's been a long day at work, you've dealt with a stroppy boss and fought you're way through rush hour traffic. So, now time for candles, a relaxing bath, glass of wine and then off to bed on a nice relaxing hard wooden floor. What? Well of course that's what your dog has to look forward to if you don't purchase a pet bed. Some dog owners believe that their bed is good enough for their pet and that they don't need their own. This isn't true. Just as you need your own space to stretch out and relax so does your pet. Also when you're out during the day, your dog is left alone and undoubtedly would prefer the comfort and warmth of their own bed for a nap. Your dogs comfort and health should be the most important thing on your list when you become a dog owner. Here are a few simple points to think about when looking for a pet bed. Check your dog's sleeping habits as just like humans, they don't all sleep the same way, and will need different kinds of beds. The bed size is extremely important to get right. In order for you to do this, you need to measure your dog's size or you can ask your vet to do it. You must take in to account your dog's length and width. Also it's a good idea to consider the shape of the dog bed you want to buy. To determine the shape of the dog bed you will need, it is best to watch how your dog sleeps; does he curl up into a ball or does he stretch out when he is sleeping? You can buy curve shaped beds as well as rectangular ones to suit your individual dog's needs. If you have an elderly dog then you may need to look at therapeutic mattresses and beds that have supportive sides. The sides can't be too high as an elderly dog doesn't want to strain trying to look out. Padded mattresses will be greatly enjoyed by your dog if he suffers from joint problems or arthritis. There are many varieties of thick, padded mattress beds that are designed to give even weight distribution, some even come with head rests. All these elements will help with joint problems. Don't forget that the pet bed you are going to choose will become part of your home décor. Just as you wouldn't pick any colour couch, don't pick any old style pet bed. Choose the bed that will best match the decorative taste of your home as once your dog becomes attached to his bed he won't thank you for getting rid of it because you've gone off the style. There are many varieties out there. Listed below are some types that may suit your dog. Sofa dog beds - dog beds that look like sofas! Donut dog beds - soft dog beds that resemble 'donuts' (or nests), they have a larger outer raised ring so the dog can get comfortable in the middle. Hooded dog beds - these have an 'arch' at the top that goes to the back, looking a bit like a 'hood', some dogs like to 'hide' and so these go down well with them. Reversible dog beds - these are handy if you want to be able to reverse the bed, sometimes they have different patterns on each side. Dogs by nature are loving, loyal pets and they deserve to be treated with lots of love and affection. Treat your pet today, with some high quality pet beds so he has the choice of your bed or his.